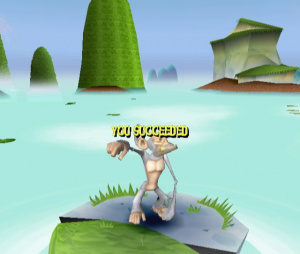 Manic Monkey Mayhem is a clear attempt by UK-based developers The Code Monkeys to make a straightforward multiplayer shooter that anyone can play. All you need is a Remote and a decent throwing arm to pick this one up, but does it have enough depth to justify laying out 1,000 Points? The controls are very straightforward: you aim with the pointer, throw by holding and making a throwing motion, jump to another platform with , dodge or curve airborne shots with the and shake the Remote to summon a banana tree for more ammunition. By tapping with good timing you can catch an incoming shot, adding it to your stockpile, but that’s really as complex as the controls get. 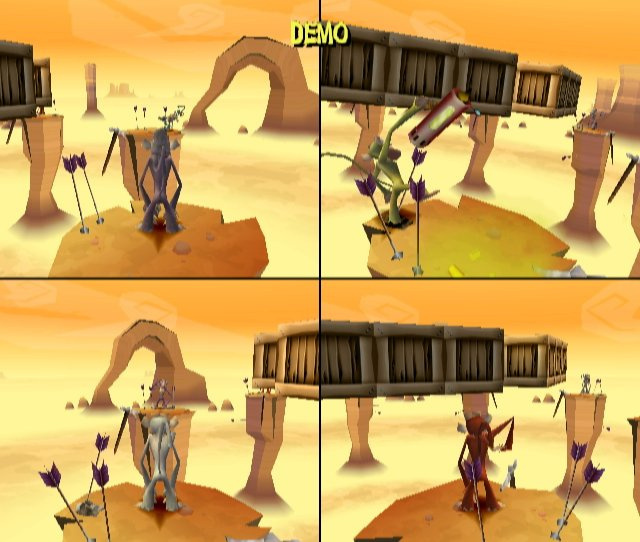 The single-player mode is divided into four campaigns – completing the opening tutorial on catching, throwing, jumping and dodging opens up three campaigns that are graded in difficulty. You can jump into the first level of whichever one you like, though it’s a good idea to familiarise yourself with the various gametypes on offer in the first campaign before attempting the rather difficult second and third campaigns. There’s no story to tie each mission together, just a simple menu to choose your next level, with each offering very different objectives: some levels ask you to survive with no ammunition, others to score more points than your rivals or be the last monkey standing after the time expires. They’re all variations on the same basic skills, but they certainly keep things more interesting than simple repetition of the standard deathmatch mode. Completing the first campaign shouldn’t take you any more than an hour or so, but the later campaigns ramp up the difficult significantly, although it does rather become a combination of skill and perseverance whether you manage to complete the game or not. Regrettably there’s no extra monkeys, weapons, levels or anything to unlock by progressing through the single-player mode, so if you’re planning to get this as a multiplayer game you needn’t even bother with single-player after the tutorial’s over. Each monkey stands on its own platform so there’s no freedom of movement over a battlefield, something that takes a bit of getting used to. Presumably a design decision to simplify the game’s third person shooting gameplay, it feels restrictive at first as there’s no higher ground or cover to take. Although each level features different numbers of platforms in various arrangements, they’re all on the same plane, so there’s little tactical planning involved other than leaping to avoid incoming bananas. That said, putting everyone on such a literal level playing field makes shooting much more straightforward, making the multiplayer battles a frenzied mix of quick aiming and platform hopping, keeping every player involved. 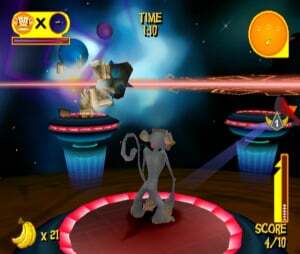 The range of multiplayer modes available is commendable: there’s individual and team play, with a particularly enjoyable score challenge where the final hit on a monkey scores extra points, opening the game up to devious players keen to steal kills and frustrate everyone in the room. The ability to split the screen horizontally or vertically is a welcome addition, and with little or no difference in graphical quality it’s the mode you’re likely to spend most of your time in if you can find a few like-minded friends. Pass the Parcel – a variant on hot potato with an exploding box – is a particular favourite at Nintendo Life Towers, as tricksy players hold onto the box as long as possible before offloading it to someone else. Sadly there’s no charts or scoreboards tracking wins and losses, so it’s hard to keep track of the sort of fierce rivalries the game’s capable of. The WiFi Connection mode is difficult to judge – we couldn’t find anyone to game with over the launch weekend, but what we played in our First Impressions article a few weeks ago was pretty impressive. When playing online, the ability to curve your shots and dodge using the is gone, simplifying matters even further (Balance Board support is also gone). Thankfully you’re not restricted by Friend Codes, so you can match up against anyone else by heading into the “play anyone” area and waiting for a game. The game decides the game type and level at random, so you’re always guaranteed something different that favours no particular player, letting skill win out. There’s sadly no indication of how many matches your opponents have played or won, meaning you go into each stranger match blind against your enemy’s skill, but it’s still a welcome alternative to Friend Code-only play. It is worth pointing out that the implementation is up there with the best we’ve seen on WiiWare, and noticeably quicker and smoother than some retail titles. There’s no leaderboards to view or statistics tracked, but if you fancy an online game you can click into the menu and be searching within seconds. MMM maintains its “keep things simple” mantra with a clear and bright graphical display and judicious use of on-screen prompts – you have a radar, ammunition read-out, health bar and a warning symbol when a banana is getting too close for comfort. Each monkey has its own victory dances and there’s a few nice touches in the backgrounds of each level but nothing that rivals the service’s best. It’s functional and inoffensive, which is what you’d probably expect, and the same goes for the game’s audio performance: there’s some nice jaunty music, monkey sound effects and even a Wilhelm Scream when falling off the platform, but nothing all that memorable. 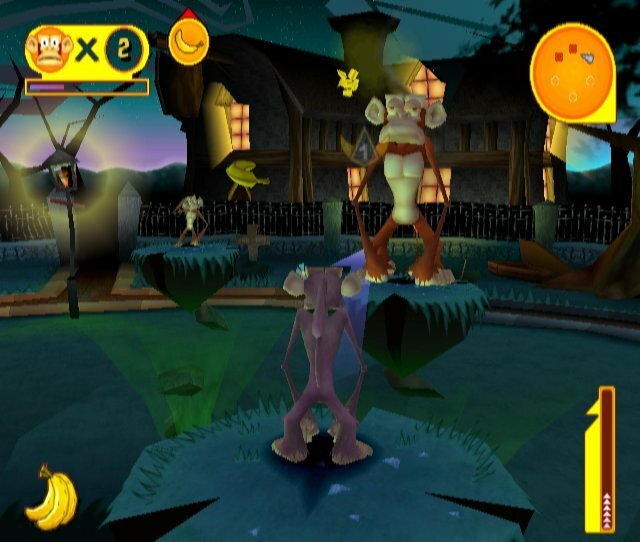 The biggest obstacle to Manic Monkey Mayhem becoming a must-have party game is simply its controls. 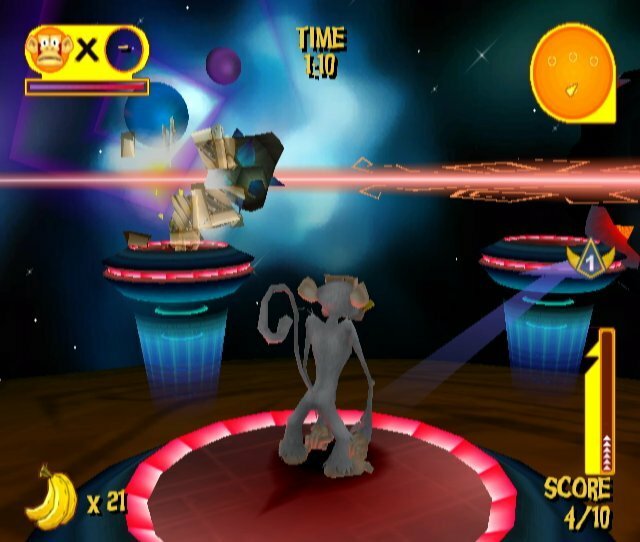 The strength of your throw is dictated by how hard you swing the Wii Remote, something that should feel perfectly natural, but sadly at times it feels either too responsive or not responsive enough: shots you felt were weighted to perfection sail harmlessly over your opponent’s head, and sometimes you’ll try a short shot to hit a monkey on the next platform and your character won’t even let go of his ‘nana. It does get easier with practice, and after an hour or so you’ll likely be hitting your targets with 80-90% accuracy, but unlike a traditional point-and-shoot game you’ll find yourself going against your instincts. Considering MMM’s intention is to remove obstacles to creating a fun multiplayer title, your friends and enemies are likely to be more frustrated by the learning curve on the controls than the fruit-based death you’re raining in on them. 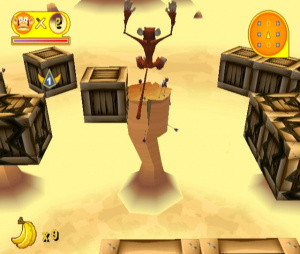 At 1,000 Nintendo Points, Manic Monkey Mayhem also weighs in at the hefty end of the market. If you have a Balance Board then it certainly adds some fun to proceedings, as you sway about in all directions to avoid incoming attacks, but it’s an added bonus rather than a main selling point. The online play – when you find an opponent – is smooth and mostly lag-free, and if you have a faraway friend who’s interested you’ll likely find some decent lastability in the online modes. If you’re buying it in the hope of matching up against a stranger, you might find it a rather long wait finding opponents. Manic Monkey Mayhem is worth a purchase if you’ve got a friend or two – near or far – whom you’ve always wanted to pelt with bananas. Once you’ve got to grips with its slightly shaky controls you’ll find the multiplayer mode to be a lot of fun, with enough variety to keep you playing for a few weeks, with its longevity predictably extended with more players onboard. In single-player it’s enjoyable but mostly unremarkable, with the main incentive for playing to improve your skills and therefore beat your friends more easily. There are more enjoyable one-player games on the service for considerably cheaper, but very few games with such a good grasp of multiplayer, so get a few of your knuckle-dragging buddies involved and go apeshi… well, just go ape. Gotta check this one out now. Great review James! Me: "What's a-pesh-e? ... Oh!" Looks like a great game to put on my goongoggles and have a blast. Great to hear it turned out good. Thanks for the review. @melkig - thanks for joining and thanks for the update too. Be sure to let us know when you have a confirmed date and we'll be happy to update the site! This is comin' 4 DSiWare too!--With Wifi! Seems like quite a few Wiiware developers have a hard time implementing motion controls into their games. What Wii/WiiWare games have "Friend Code-only" online play? Every Wii/WiiWare game with online play that I have allows random matches without friend codes. Good review. Think i'll pass though. Judging from the 11 comments (many from NA) I'm guessing this wasn't a big seller. At least I don't have to wait for the review.